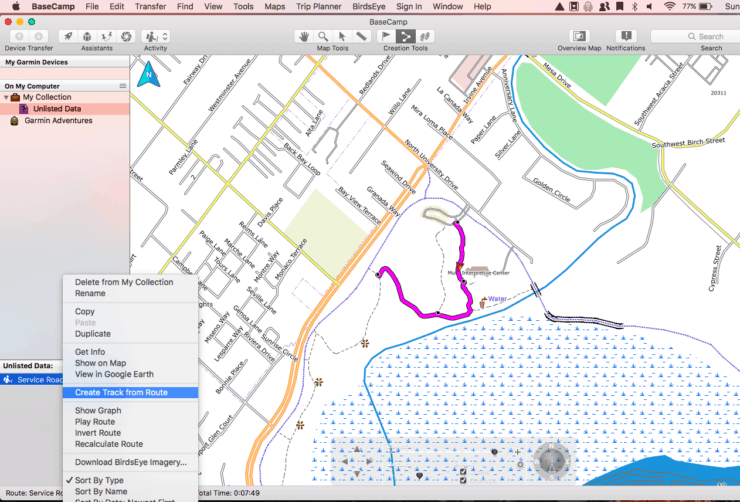 To start, you’ll need to plan your hike and create a track, which is saved as a GPX file. A GPX file is simply a text file with a list of lat/lon coordinates specifying a track. My tool of preference for creating a hike is Gaia GPS. They have a tool that allows you to specify waypoints, and then Gaia will automatically “snap” a route onto the appropriate hiking trail. Create a hike by specifying waypoints. 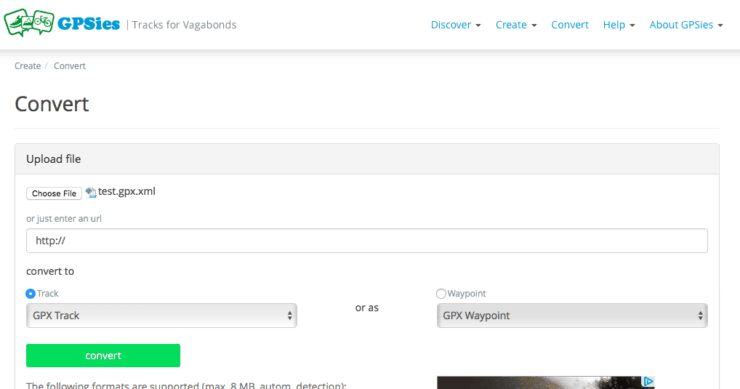 After you create your waypoints, GaiaGPS will automatically snap a track to the trail. Once you’re done creating a hike, you can go to the page for that route and download it as a GPX file. If you’re on a Mac you might have to change the file name from trackname.gpx.xml to trackname.gpx (kill the xml part). You might also have to convert your file too (see below). This is an issue with certain browsers, not you. I use Gaia as an offline mapping tool on my smartphone too. I encourage you to check it out. 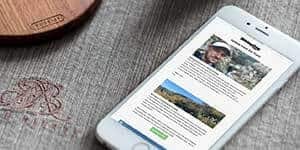 HikingGuy users get 20-40% off a premium Gaia GPS membership with this link. If you don’t want to automatically “snap” to trails, then try GPS Visualizer. It’s another free tool that let’s you create hike track points on it’s “draw on a map” tool. You have total control of the track and it’s points. GPS Visualizer also has a ton of different maps available that you can create your track with. It’s a powerful tool. 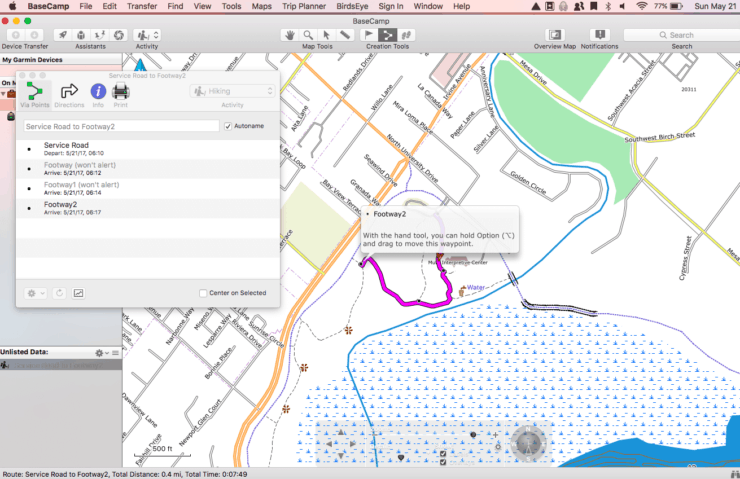 Click on individual track points to manually create a hike in GPS Visualizer. After you create your hike, download it as a GPX file. 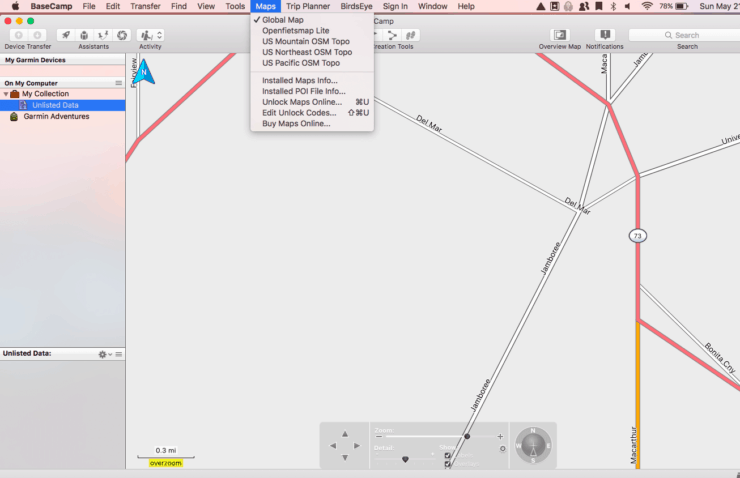 You can also create a route directly in Garmin Basecamp, even if you didn’t buy their maps. Before you start, you need to install some free routable maps. There are more and more options every week. GPSFileDepot is a good place to start. My favorites are the Open Street Map topographic routable and the Open Street Map routable bicycle (it has trails). Each source has it’s own install directions, make sure to read them carefully. Once your maps have been installed, you can access them in Garmin Basecamp. After you installed your free maps, go to the Maps drop down and pick the maps that you want. Note the very minimal free Garmin base map. Not really good for much. And voila! You can see the fidelity of the free topographic maps is very detailed. Here you can see my route coming together. After you finish, you can send the route to your Garmin. Routes work like an automotive GPS, with alerts when you need to turn. It works differently on different devices. I recommend converting it to a track and sending that. It’s simple and it works more universally. 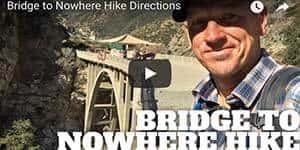 If you are going on a hike from this website, I have GPX files for every hike available for download in the maps section of a hike. Garmin actually has a course planner on Garmin Connect. Like most Garmin software, it’s just not the easiest to use or figure out. It also has limited map support. I wish Garmin’s expertise in hardware would translate to software, but it often does not. If you want to create a cycling route, you can try GPSies, RouteLoops, BikeRouteToaster, or the popular BikeMap.net. Once you have your GPX file, you need to transfer it to your Garmin GPS. I’m using my Fenix, but this should work with all Garmin GPS units. Garmin Basecamp is a route planning tool for those who own Garmin Maps. Garmin Maps are great, but expensive, and hard to justify with all the other free options. If you own Garmin Maps, you can do all your route planning in Garmin Basecamp. 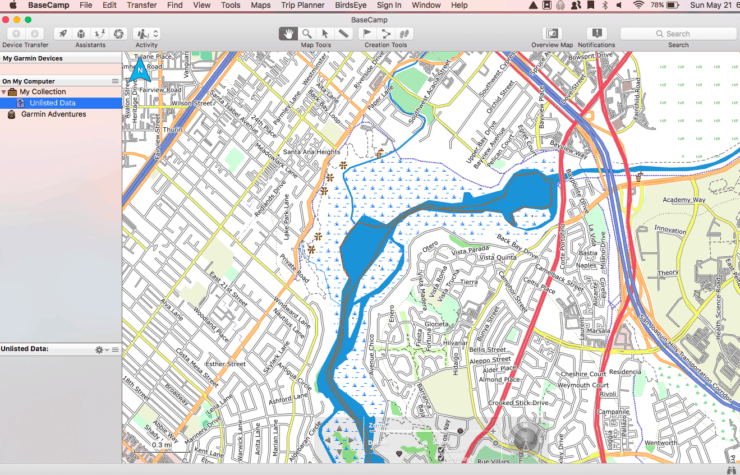 If not, we’ll use it (without Garmin Maps) to transfer the GPX file we created earlier. Download and install the free Garmin Basecamp software on your machine. Create a new list in Garmin Basecamp where you will drag the GPX hike you created. That will create a new folder on the left side called “transfer”. 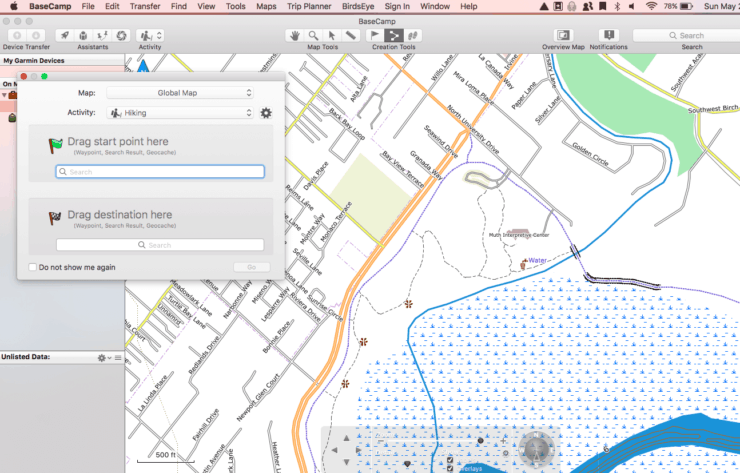 Simply drag your GPX file into that folder, and it will be imported to Garmin Basecamp. 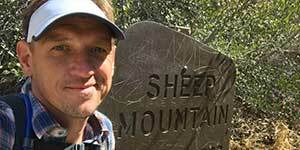 Your GPX hike file will be on the left hand side. You can have Basecamp zoom to it. Notice the basic maps that Garmin provides for free. You’ll notice that (unless you own Garmin maps) there are no detailed maps. This is okay. UPDATE: If you get an error when dragging into Garmin Basecamp, you need to do this extra step. Visit https://www.gpsies.com/convert.do – upload your GPX file, and then convert to file type GPX. Drag that file into Basecamp. You convert from GPX to GPX. It’s weird but it works. Plug your Garmin GPS into your computer. If you haven’t setup your Garmin GPS with your machine, check your manual for the procedure. Most devices need Garmin Express, which will let your Garmin GPS sync with Garmin Basecamp. Once you see your device in Basecamp, right-click (or control-click on Mac) on the track you created, and then hit “send to device.” It’s that easy – your GPX is now on your Garmin GPS. Right-clicking on the track allows you to send it to your Garmin GPS device. To start, I don’t recommend hiking with this GPX track alone. When I hike, I read the hike guides, trip reports, look at a map, and print out whatever materials I need. 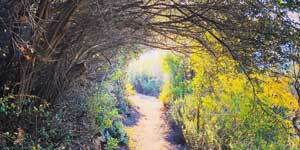 I use the Garmin GPS as a quick and easy way to ensure that I’m on the trail and heading the right away. 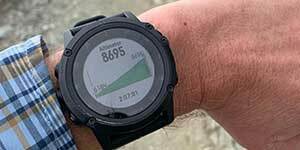 How you actually access the hike track depends on your Garmin GPS unit. You’ll want to access the navigation features to follow a course or track. On my Garmin Fenix 3, I can do Navigation > Courses > [track name] > Start. I can also access it from my “hiking” activity page. The important thing is that you’ll want to be able to see the track on screen. When you look at the map screen, navigation is easy. 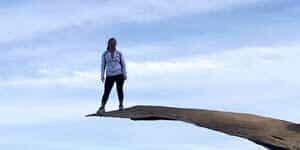 Just stay on or close to the line representing the hike that you created. Some units (like the Fenix 3) have an alarm that tells you if you’re off course. It’s dead simple and it works. Checking my position against the GPX hike I created earlier on my Fenix 3. Notice how the line shows I went off trail for a bit, then came back on trail at this point. A typical use case for me is when I’m hiking, and then the trail really thins out, or I stop seeing trail blazes. I get a feeling that I’m not on the trail anymore. When that happens, I look at my Garmin GPS device and see if I’m on (or close to) the hike track that I created earlier. If I’m not, I backtrack until I get on the track line, then head forward again, this time avoiding the off-trail detour.